Here is something new and a bit different from Gerry Douglas and his design crew at Catalina. In the past Catalina has stuck to a very conservative look that in time has distinguished it from the more contemporary or Euro-influenced designs. But with its new 425, Catalina has moved in the Euro direction a bit and is producing a boat that is aesthetically on a new tack. I like the look of the boat. To my eye the style is clean, simple and strong. This is a relatively light design with a long, 39-foot 1-inch DWL for a D/L of 130. The freeboard is high. The sections show a small amount of deadrise running all the way to the stern. The L/B is 3.18 and the beam, while broad aft, is not as exaggerated as we see on some current models. 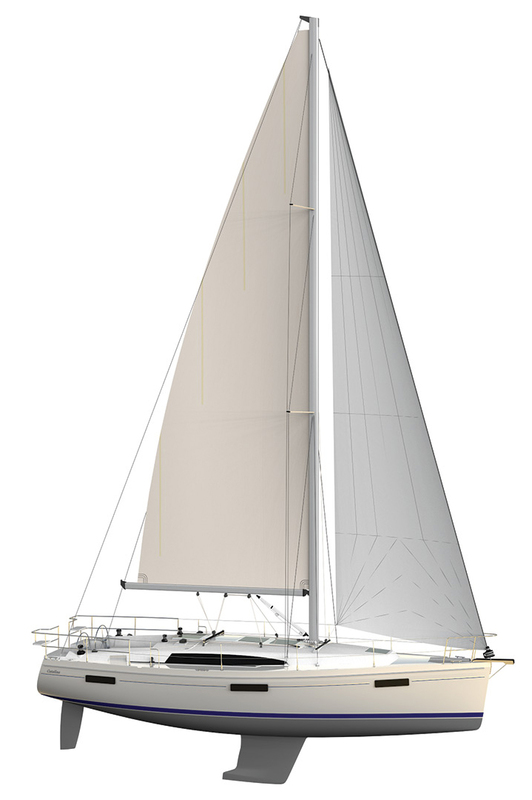 You can choose the standard keel with a 6-foot 8-inch draft, or the shoal keel with a 4-feet 11-inch draft. All in all this is a very moderate hull form, with plenty of beam and DWL for good initial stability. Note the nacelle for the prop shaft. I think this makes for a quicker engine installation than a traditional exposed shaft and strut. 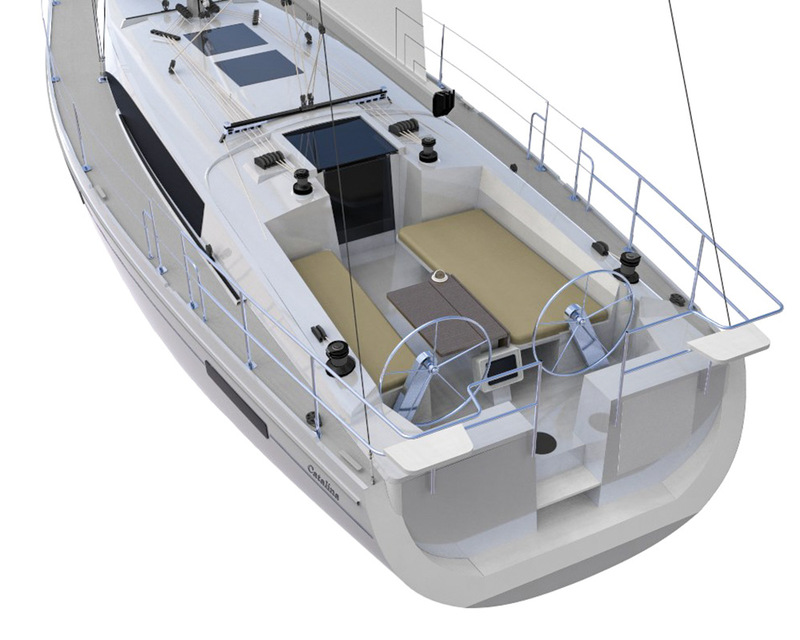 In contrast to the European models, Catalina offers only one interior layout, but it is a well-thought-out design. There are three sleeping cabins, each with double berths. There are large hanging lockers in the mirror-image aft cabins. The port quarter cabin berth is split so you can access the engine area. The galley, to port, is very nice with plenty of counter space. The U-shaped dinette looks more than adequate. There are lounging chairs on the port side. I’m not wild about chairs but I know many people like them in favor of a settee. There are two heads,and the forward one has a shower stall. There is no nav station, but today with most of the navigation done on a laptop, I don’t see this as a major problem. Nav stations as we know them are beginning to disappear from many new designs. This layout would be excellent for a couple with two kids. The nice thing about high freeboard is that it provides more volume below, while allowing for a lower cabintrunk. The problem with low cabintrunks is that it’s hard to fit opening portlights in the sides. As my pal Special Ed says, “Always something, never nothing.” So while there is plenty of deadlight area for a nice feel below, I think nothing beats portlights for ventilation in the summer. Now study this deck layout. Let me know when you find the unusual feature. I’m waiting. OK, look at the cockpit area with its twin wheels. Look at the cockpit seats. Note that the starboard seat is much deeper than the port cockpit seat. This is brilliant! If you are going to sit upright all you need is an 18-inch deep seat. But if you want to really relax and sprawl you need at least 22 inches of depth and 36 inches is even better. If you doubt me, the next time you go sailing with the family just look how people sit on the settees when you are underway. Women like to sit with the legs curled up under them. You can’t do this on an 18-inch-deep seat. Whoever made this design decision should get an award. Plus, think of the comfortable napping place it makes. I know my boys would have fought over it as their sleeping spot for the night. The rig is tall with a SA/D of 21.69 and a self-tacking working jib. There are inboard jib tracks on the deck if you choose to carry an overlapping genoa for light air. The self-tacking jib sheet leads up the mast from the car to come back down to the deck and lead aft. It seems like an odd arrangement but you see it on a lot of big boats. It gives you the freedom of bringing that single sheet aft wherever you want it. The headstay is dropped from the masthead to make room for an asymmetrical chute on a furler. It’s good to see Catalina try something a bit different. LOA 43’6”; LWL 39’1”; Beam 13’8”; Draft 6’8” (standard) 4’11” (shoal); Displ. 17,500 lbs. ; Ballast 7,000 lbs. ; Sail area 914 sq. ft.; SA/D 21.69; D/L 130; L/B 3.18; Auxiliary 57-hp Yanmar; Fuel 56 gal. ; Water 114 gal.